My local game store (Guardian Games) carries Lego. Their selection of sets doesn’t do much for me, being that they are all retail or above, but they do have a big table of used Lego. The selection varies from visit to visit, but I’ve found that I can often find an interesting selection of older brick. Since I’m interested in building outdoor environments like rocks and dirt and foliage, it doesn’t bother me to use well used bricks. The scuffed surfaces and occasional discoloration lend a more organic effect. Here are the last two bags that I bought. I bought this first bag a couple of weeks ago. The bin wasn’t super full, but I was able to get a lot of useful pieces in a selection of natural tones (grays, browns and greens.) I grabbed a bunch of yellow too, for an alien environment project. After separating it out, I have a nice selection of gray slopes in various shades, and respectable piles of browns and tans. One of the nice things about buying old bricks is the inclusion of the old shades of gray as well as their newer bluish counterparts. Having all four shades (more with sun or age faded bricks) makes it easier to produce interesting color textures in rock. None of these bricks would be all that good for building shiny new spaceships. 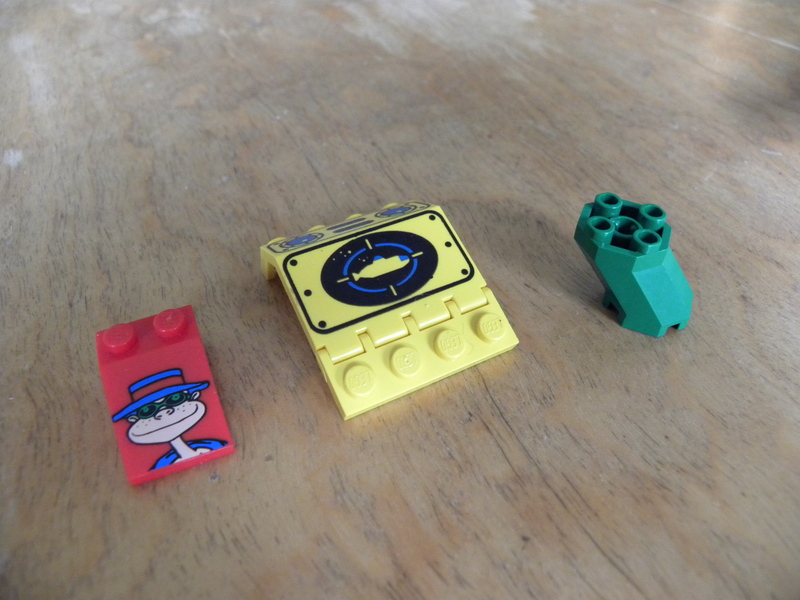 Among the interesting pieces in this bag were a red slope with the Hamburgler’s face, a yellow panel from the old Aquanauts theme, and a green octagonal brick. None of them are particularly valuable, but fun finds none the less. I picked up the second bag just this week. The table was super full, but mostly with colors and pieces that didn’t interest me much. 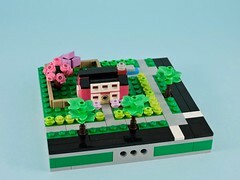 I wound up with a bigger variety of pieces, but still grabbed a bunch of fun bricks. From the contents, it is easy to see that I wound up with a bigger variety of colors. 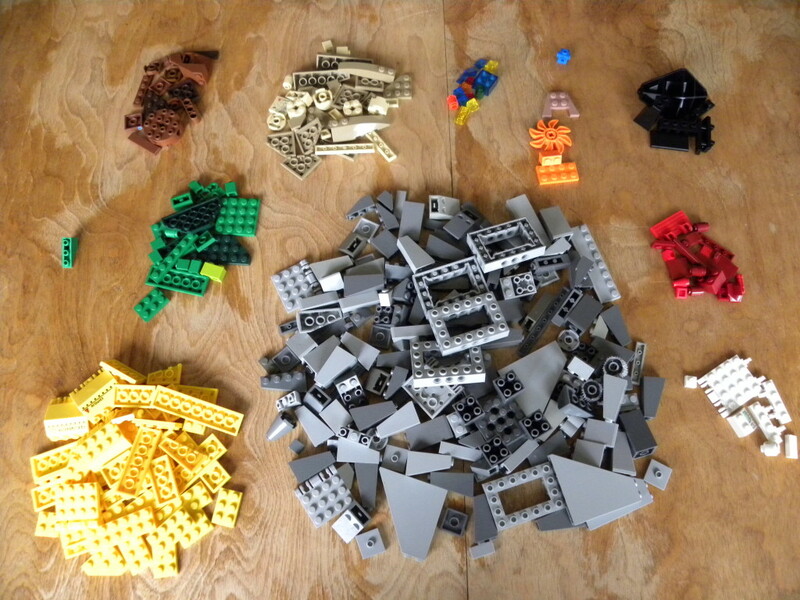 There were a bunch of interesting click-hinged plates and panels that I scooped up, along with some technic bricks that might come in handy for ship super-structure. This time, I scored a bunch of little translucent pieces. 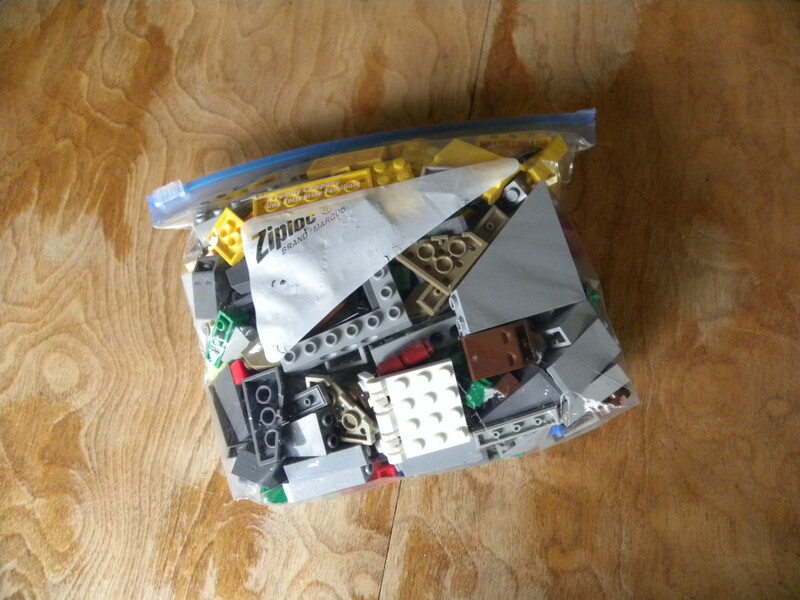 The interesting pieces in this bag were all things a bit weirder. 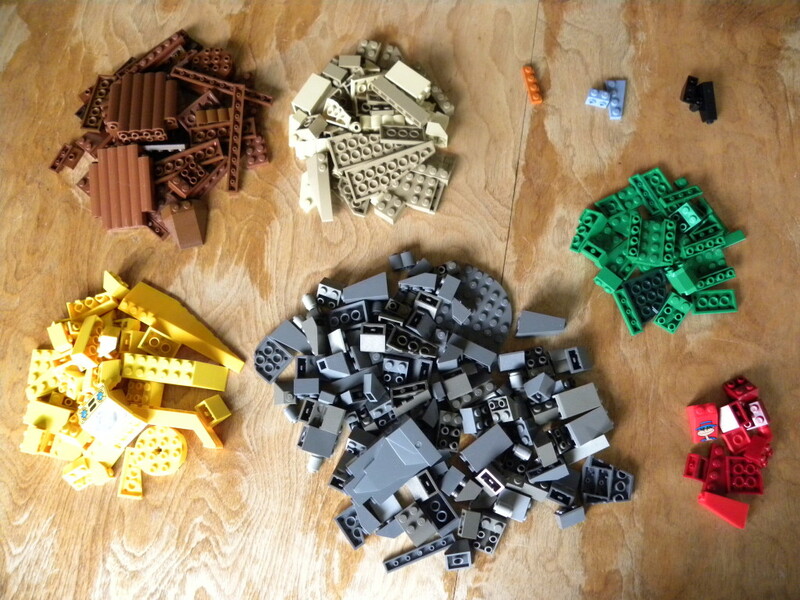 There usually aren’t minifig parts in this table, so I was happy to get a head in a white balaclava. 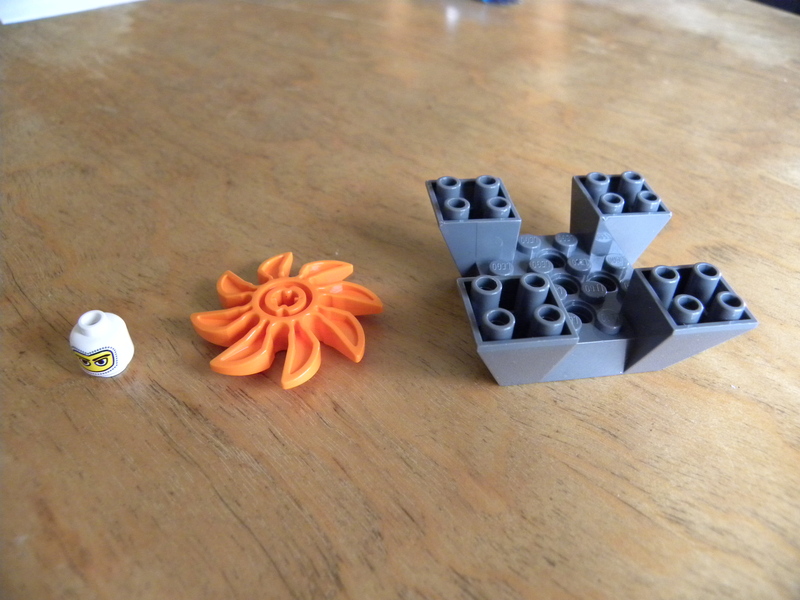 The orange pin wheel and the big gray bricks were just a bit too unusual to pass up. Either one could be the inspiration for some build. As far as pricing goes, they charge $10 for a quart sized bag and $25 for a gallon. Obviously, the gallon is a pretty good deal, but considering how long it takes me to find enough good pieces to fill a quart bag, I’ve never bought a larger one. These two bags came out to 306 and 325 pieces respectively. Based on the $10 that I paid, my price per piece came out to just a hair of 3 cents. 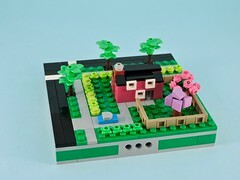 Not bad, even for used bricks. Now, I’ve got some more sorting to do.